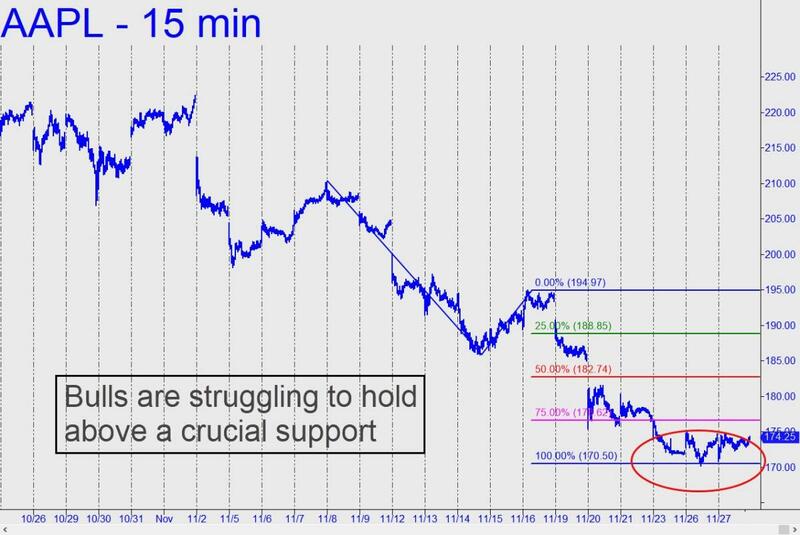 AAPL is struggling to hold above a crucial ‘Hidden Pivot’ support at $170, but if it gives way expect the broad averages to take another nasty leg down in sympathy. The stock is sufficiently oversold to be primed for a bear rally of perhaps 8-10%. But who would do the buying? Ordinarily, short-covering is the only source of bidding strong enough to excavate a stock from a trough as deep as the one AAPL has fallen into over the last month. But a bear squeeze seems increasingly unlikely now that the threat of a tariff on iPhones is in the news. Trump said Tuesday that he was considering broadening the trade war against China with levies on some high-volume consumer electronics products, including the iPhone. This could significantly impact the Cupertino retailer’s bottom line, since Apple is already meeting stubborn price resistance from consumers who seem to have discovered they can live without the latest iPhone model for an additional year or two. Even if Apple ultimately dodges the tariff bullet, uncertainty about the outcome is likely to persist in the months ahead. Under the circumstances, investors should prepare for more weakness in Apple shares, which could drop quickly to the 162.43 target I broached here recently. With AAPL currently trading for around 174, that would represent a 6.6% fall and a 30% decline from the all-time high of 233 recorded nearly two months ago. If you don’t subscribe but want a peak behind the headlines, click here for a free two-week trial to Rick’s Picks. It will give you instant access to all features and services, including a 24/7 chat room where great traders from around the world share ideas that can help you profit, as well as to 'impromptu' online sessions like the one described above.